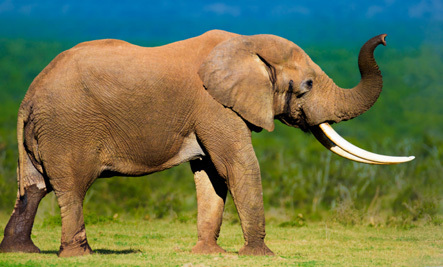 Authorities in Zimbabwe say that a suspected poacher was killed by an elephant after he attempted to shoot the animal. Rangers found the body of Solomon Manjoro inside a national park, and believe he was attempting to poach in the protected Charara safari area. According to Zimbabwe’s Sunday Mail, Manjoro and an accomplice entered the park in mid-to-late April, with plans to hunt elephants for their ivory. However, things didn’t go as planned for the poachers. And it’s not best for the elephant, karma-wise. * Cosmic Loti’s editing thing is currently broken. When I’ve fixed it and my migraine’s gone, promise I’ll do a new post. Sorry to hear your editing thing has broken and hope your migraine has lessened. Agreed 🙂 The elephant’s most probably already seen what normally happens when someone starts shooting things. It was reasonable self defence, wasn’t it. Thanks for sharing/re-blogging this post Jas. Thanks Jon 🙂 It’s a good one, isn’t it. Yayy for the heroic elephant!! Some tourists were driving in a car through the Australian bush when they hit a large old-man red kangaroo. What a great photo opportunity! The animal stood about six feet tall and would really impress the pals back home So our intrepid visitors propped the roo up, and to add that little bit of humour, one of the blokes put his jacket on the roo. You guessed it! The roo was only stunned and promptly hopped off into the distance complete with jacket, wallet, passport etc. Another one I’m quite fond of tho’ I probably shouldn’t be, is the giant saguaro cactus that toppled over, killing the silly sod that was plugging it. Ah yes, you might be right with that one. I think it was just it its arm that fell on poor Grundig. Again, can’t blame the cactus. Doesn’t it take about 75years for a cactus to grow an arm? Not as bad as killing the whole cactus, and consequently its dependent ecosystem, but Grundig had already done that earlier apparently.